Elephants might all look the same at first glance, but two species of elephants actually live on the earth – the Asian elephants and the African elephants. Asian elephants are smaller than African elephants. Their ears are smaller, too. Only male Asian elephants have tusks. African elephants are larger and have big, floppy ears shaped like the continent they come from – Africa! Both male and female African elephants have tusks. Elephants are the largest land mammal. 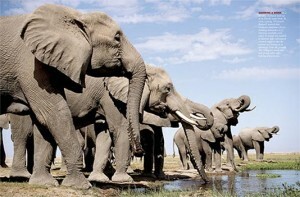 More all about elephants, adults weigh between 6,000 and 11,000 pounds. Elephants are the largest land mammal. Adults weigh between 6,000 and 11,000 pounds. That’s as heavy as a big truck or SUV. Elephants need to eat a lot to fuel those big bodies. In the wild, they eat up to 450 pounds of food each day. Elephants are herbivores. They eat plants, grass, tree bark, and of course, peanuts. 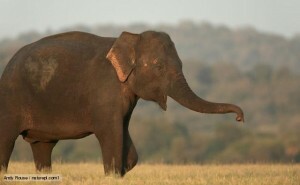 Asian elephants are smaller than African elephants. Their ears are smaller, too. 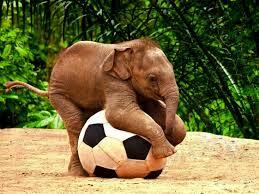 A baby elephant weighs up to 250 pounds. That’s more than your dad weighs! Never ever purchase any products made from ivory, this is how poachers make their money. There are 16 muscles in the trunk of an Elephant. The trunk has up to 100 muscles. Elephants are afraid of bees. To protect farmland from hungry elephants some farmers place bee hives on the outskirts of the farmland. A female elephants gestation period is 22 month. That’s the longest pregnancy period in whole animal kingdom. You know the way we humans hug to greet each other? Well elephants hug each also by wrapping their trunks together. A baby elephant (calf) just like humans will lose their first set of teeth. They will also lose their first tusks. When you look at an elephants tusk you do not see the total size. Up to 1/3 of the tusk is hidden in the skull. An elephant will also use its ears to regulate body temperature. African elephants are larger and have big, floppy ears shaped like the continent they come from – Africa! 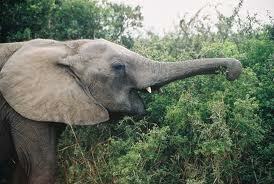 Both male and female African elephants have tusks. They eat plants, grass, tree bark, and of course, peanuts. A video of adult elephants helping a drowning baby elephant. Question 1: How long do elephants live? Answer 1: Elephants can live up to 70 years. Question 2: Are elephants smart? Answer 2: Elephants are among the smartest animals in the world. They can work together and solve problems. Elephants have a largest brain of any animal. Question 3: What is a baby Elephant called? Answer 3: A baby elephant is called a calf. Question 4: What is a male Elephant called? Answer 4: A male Elephant is called a Bull. Question 5: Have Elephants good hearing? Answer 5: Elephants have excellent hearing. They have better hearing than us humans. Elephants can hear some sounds up to 1.5 km away. Question 6: What is the largest land animal? Answer 6: Elephants are the largest land animals. The African Elephant is the largest of the two types we have in the world. The Asian Elephant is the smaller of the two. Question 7: Can Elephants Jumps? Answer 7: Elephants cannot jump. Question 8: How thick is an Elephants skin? Answer 8: An Elephants skin is an inch thick. Question 9: Is it true that Elephants purr? Answer 9: Yes Elephants do purr. They do this as a way of communicating to each other. Question 10: Why to Elephants have tusks? 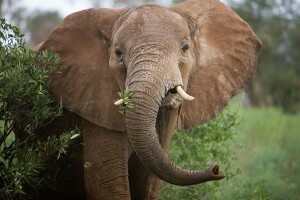 Answer 10: An Elephants tusks are made of Ivory, they use the tusks for digging, lifting and when defending themselves. Question 11: Do Elephants get emotional? Answer 11: Yes Elephants have emotions just like we do, they cry, laugh and have an absolutely fantastic memory. Question 12: Can Elephants swim? Answer 12: Yes Elephants are good swimmers. They use all four legs to swim and they use their trunk to get air when in deep water. Enjoyed the Easy Science for Kids Website all about Elephants info? Take the FREE & fun all about Elephants quiz and download FREE Elephants worksheet for kids. For lengthy info click here. Declan, Tobin. " Fun Elephant Facts for Kids ." Easy Science for Kids, Apr 2019. Web. 25 Apr 2019. < https://easyscienceforkids.com/all-about-elephants/ >.